BURKE, Va. (CNS) — Mary Susan Burnett-Miller was reading a magazine in a laundromat while on vacation in July when she read about the desires of a homeless man named T-Bone. The story she was reading originated in Ventura, California, where years earlier a group of people asked T-Bone how they could serve him. “If I had clean clothes, I think people would treat me like a human being,” T-Bone responded. Out of that came Laundry Love, an organization providing free laundry services to people in need. Burnett-Miller, a longtime parishioner of Church of the Nativity in Burke, returned home and knew she had to start the ministry. With the support of her pastor, Father Robert Cilinski, and a template from Laundry Love, she began to research laundromats that might host the group. Only Charlie Johnson and his son Blair, co-owners of a chain of northern Virginia laundromats, answered her inquiry. The elder Johnson was ecstatic to get her call, said Burnett-Miller, and knew just the place that would work: Laundry World in Falls Church, a facility that serves many people who could use a little help. Support came pouring in when Burnett-Miller announced the group at the church’s ministry fair and at Sunday Masses. “I thought we were going to get like 15 people signed up, but we had 75,” said Sydney Grace Miller, Burnett-Miller’s daughter who is a senior at Thomas Jefferson High School for Science and Technology in Alexandria. As a bonus, the detergent bottles and dryer sheets, which are stored in the family’s basement, make the house smell great. The next step was to advertise in the laundromat so that customers would understand their mission. When volunteers from the parish arrived the first Saturday of October, the lines were out the door, Burnett-Miller said. Volunteers set out coloring books and toys for the children and a table of snacks and hot chocolate. Then they got to work on the laundry. Men and women loaded their own clothes after which volunteers came by with several detergents from which they could choose and swiped the money card that started the machines. After their third laundry day, Dec. 5, Nativity’s Laundry Love had provided 1,145 free loads of laundry to the community. “We are so blessed to be able to help them in this small way,” Burnett-Miller said. In addition to helping people with their laundry, the group hopes to be able to befriend the people they serve. On one Saturday, a mother came in with two children and a baby. The volunteers held the baby and played with the children to give the mother a chance to fold her laundry. “It’s nice to make their day a little easier,” Burnett-Miller said. The simplicity and impact of the project is what first attracted Burnett-Miller to Laundry Love. The laundromat is a safe, warm environment where entire families can come to volunteer, she said. Her daughter added, “People mostly think people need food (and) clothes, but they don’t think people need clean laundry. If you think about the less fortunate kids in school, they’re maybe embarrassed because their clothes smell bad or their sheets are dirty,” Miller said. 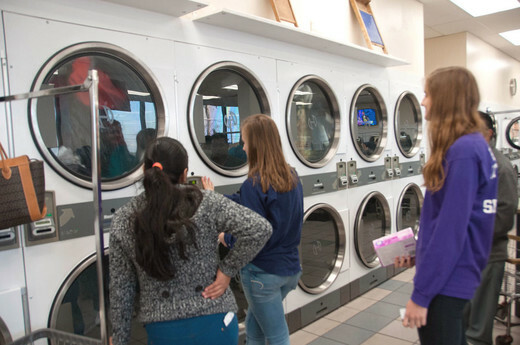 Amy Smith, an eighth-grader at Lake Braddock Secondary School in Burke, first heard the announcement for Laundry Love at Mass and immediately asked her mother if they could volunteer. Nativity parishioner Barbara Olson also came because her 13-year-old daughter asked to volunteer. Di Mauro is a staff writer at the Arlington Catholic Herald, newspaper of the Diocese of Arlington. NEXT: Regs force March for Life to change rally venue in D.C. Does Catholic charities have a program for helping people with assitance in doing their laundry?